Gardens, by nature, are green but there are a few simple changes you can make to ensure that yours is also as eco-friendly as possible. One of the most important things if you are creating a garden from scratch – or planning changes to your existing patch – is the hard surfacing you use. Over the past 20 years, many people have covered over large parts of their garden with either concrete or paving slabs to cut-down on the gardening. Sadly, as well as affecting insects and wildlife, this has caused an increased risk in flooding in many areas. Quite simply, water which previously drained away through the soil now has nowhere to go. So, if you are planning any hard surfacing make sure you look at the eco-friendly alternatives available. (In fact, non-permeable surfaces now need planning consent for areas of more than 5 sq metres because of the flooding risk). There are many types of surfacing which still allow rainwater to drain away. 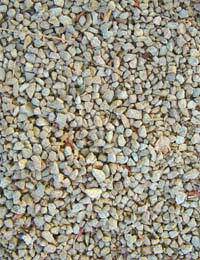 Gravel is good – although without borders to retain it you might have to sweep it back into place occasionally - or you could use new grids, made from recycled rubber which allow water to soak away. Next, you should think about garden features such as lighting and seating. Always choose timber from a sustainable source rather than plastic patio furniture. Plastic is available at a very low price but often looks shabby after just one season, making its price a false economy. Lighting adds a whole new dimension to your garden during the summer months but make sure you opt for solar powered lamps and feature lighting rather than lights which need electricity. Again, plastic versions are available but often they don’t withstand our British weather for long so it makes sense to go for a sturdier alternative. The initial investment may be higher but in the long run they will work out less expensive. Many local councils now provide “green” bins for garden waste but creating your own compost bin will cut down on the amount of waste that needs to be taken away. Many councils now supply compost bins at much less than the shop price but it’s even better if you can make your own compost box. All you need are a few pieces of unwanted timber cut to length and then nailed together. Boxes are much easier to use than a tall plastic bin and they look much better too! You can compost most of your leftover vegetable peelings and fallen fruit and some people also add shredded newspaper and cardboard. Grass clippings can also be added but try not to add too much woody waste from the garden (such as tree cuttings) since this takes a long time to decompose. Instead, simply lie the wood under a hedge or behind your compost bins and it will eventually rot down. Alternatively, if you have a lot of woody items, you could borrow a shredder and turn it into mulch. Another excellent idea for a garden covering is recycled rubber. Old tyres have long caused a recycling problem but are now being turned into shredded garden covering. Make sure your garden takes account of our feathered friends. Due to the loss of large amounts of farmland and woods in the past half century, gardens are now even more important to birds. It’s always worth attracting birds into the garden. Apart from the fact that they are such fun to watch, they will help with your gardening by disposing of pests such as greenfly. You can create a bird feeding table very easily from unwanted wood – or if space is at a premium you can hang bird feeders from trees or even the end pole of your washing line. If you have no washing line, that’s something you should definitely change as soon as possible! Not only are clothes easier to iron when dried outdoors, it means you aren’t using electricity all year round on the tumble drier. If you have limited space, you can buy a rotary washing line which can be taken down when the children want room to play. Finally, every garden should have a pond. Even if your garden is small, you can create a mini pond using anything from an old washing up bowl to a hub cap from a car. After all, it doesn’t have to be large to attract insects such as pond-skaters and with any luck it will also provide a breeding ground for frogs.